Sydney Uni Velo Club members are required to be a member of Sydney University Sport and Fitness (SUSF). New and renewing members can join SUSF when purchasing their Cycling Australia membership licence. Transferring members will need to join SUSF separately. The cost includes your Cycling Australia license and the SUVelo club fee. Cycling Australia will issue you with a licence within 4 weeks, however, a receipt will be emailed to you that will act as an interim licence that will allow you to enter races while you await your plastic licence. The SUVelo Secretary will also be notified of your membership and will be in touch to help with any of the remaining administrative steps. Visit Cycling Australia membership website and select ‘Renew Now’. Enter your Cycling Australia username and password. Check your details haven’t changed since you last registered, update them where applicable. You will be prompted at the end to supply your credit card details for payment of fees. This cost includes your Cycling Australia licence and club fee. Cycling Australia will issue you with a licence within 4 weeks, however, a receipt will be emailed to you that will act as an interim licence that will allow you to enter races while you await your plastic licence. The SUVelo Secretary will also be notified of your membership and will be in touch to help with any remaining administrative steps. If you are (or have been) a member of another cycling club within the past 2 years and wish to join SUVelo, the process is a little more involved. Changing clubs at the same time that you are renewing your Cycling Australia licence does not incur a transfer fee. If you are transferring and have a current Cycling Australia and it isn’t during the licence renewal window (October – December), a transfer fee of $50 is payable. This fee covers reprinting of membership card, postage and administration costs incurred by Cycling Australia. To transfer to SUVelo, you will be required to complete a transfer form and have it signed by the relevant parties. Contact Cycling Australia on (03) 9998 6810 and they will process your transfer immediately. Have your credit card details handy; a $50 transfer fee is applicable for mid-season transfers. Become a Community Member of SUSF. Important: You are also required to forward confirmation of your membership purchase to the Club Secretary. Please email SUSF membership confirmation to secretary@suvelo.com.au. If your Cycling Australia licence is not current and you would like to renew at the time of transfer, please advise the Secretary. Once Cycling Australia confirms the transfer, you can then go to Cycling Australia’s website and renew directly online. You will be issued with a receipt that will double as a temporary licence to allow you to enter races while you wait for your plastic licence to be sent to you by Cycling Australia. What does a Cycling Australia membership licence offer? Encompasses all racing categories. Racing membership is a calendar year membership. It is age-based and is a full competitive membership that entitles participation in all forms of racing conducted by Cycling Australia and its affiliated States and Clubs. Categories include Elite, Masters, Masters 65+, U23, U19, U17, U13, U11, U9. Masters aged 30+ have two options: a Masters licence or an Elite licence. Masters membership enables the rider to enter masters events only and graded racing at club or club-combined level. An Elite membership permits a Masters rider to enter any racing event including Elite racing events, national open and championship events; as well as contesting Masters category events including State and National Masters Championships. Note that license memberships taken out in October will be valid through until the end of the following calendar year – that’s a full 15-months of racing! Applies for new memberships, renewals and transfers. Cycling Australia has made transferring your membership much easier too; an email to membership@cycling.org.au requesting your transfer is all that’s required, and they’re normally very responsive. Tip: avoid the Christmas holiday period for a faster turnaround with all license related matters. The Ride+ membership allows you to participate in recreational rides, charity and fun rides, club training, coffee crew rides, Gran Fondo and Cyclo Sportif events and club run skills development events. This licence does not allow you to race, including competing in SUVelo Club races. Ride+ memberships are available at any time of year. The membership lasts 365 days from the date of joining. Cycling Australia requires that all riders must have a current membership card and be current financial members of a club to participate in racing and club riding activities. Membership is obtained through purchase of an appropriate licence from Cycling Australia. Current students of Sydney University are eligible for a discounted Club fee of $20. Please advise the SUVelo secretary when you have purchased or renewed your licence and you will be reimbursed the discount after registration with Cycling Australia. What does a Sydney Uni Sports & Fitness membership provide? A community membership allows you access to all Sydney Uni Sports and Fitness facilities at the casual rate. For more information about SUSF and how you can join (for transferring members only) view their website. The latest order closed on Sunday 24 February 2019; delivery is expected approx. 24-April. If you’re a new member and you just missed out, then get in touch! The next order will open in time for a mid July delivery and WON’T include any short-sleeve kit options. How do I purchase SUVelo kit? Login to our Cuore Team Shop. 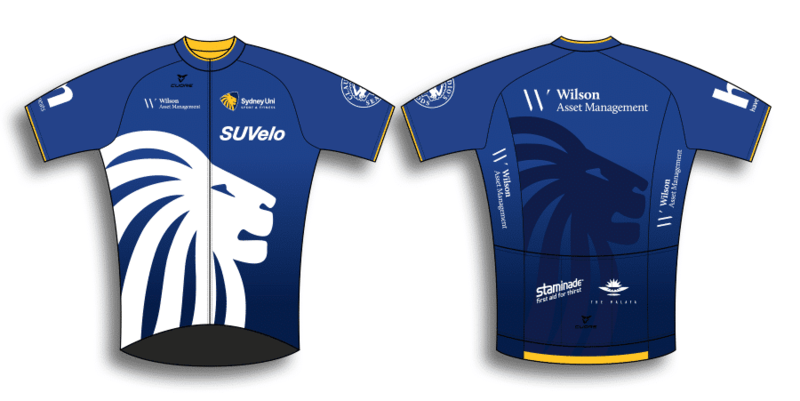 When the Team Shop is open, a password will be supplied via email to all SUVelo members. How frequently will the Cuore SUVelo Team Shop be available? We are planning to have the shop available 4 times per year – effectively one per season. We’ll always announce details nearer the time. Do you keep any spare stock? If you’re new to the club, please get in touch for details. Sometimes we order some additional items for new members – but there are only ever limited quantities and sizes. How does Cuore’s kit sizing compare to, say, Rapha, Champion System, Castelli etc? There is a size chart available on Cuore’s website. Every manufacture’s clothing fits differently. We can’t stress enough how important it is to try on sample kit and be 100% confident that you’re ordering exactly the right sized garments for you. Cuore offer a variety of tailoring options – you can adjust the sleeve length on jersey and 2-in-1 road/skin-suits, leg length on bib-shorts and 2-1in-1 road/skin-suits, and even the torso of jersey, jackets and 2-in-1 road/skin-suits. It’s not just ‘fit’, it’s your personal preference too. And don’t forget – this is custom kit; you get what you order – you cannot return it to the shop for a different size. Did we mention how important we feel it is to try on sample kit for sizing? Where do I try sample kit on? Cuore’s store/office is located at 2/81 Buckland Street, Alexandria. They are ordinarily open 9am - 5pm Monday to Friday. They are not open on weekends. We strongly recommend you contact them on 0402 379 907 before heading over. They’re a small team so understand that you may need to be a little flexible. We believe it is very competitive, and the quality of the kit is up there with the best on the market. Quantities of specific garments dictate pricing; the more we expect to order of a particular item means we get a greater level of discount. This is also why we only offer a select range of items in each Team Shop, to maximise the quantities we’ll sell of a particular garment, and therefore keep prices down. SUVelo leverages Cuore’s experience to guide us, and as a club, we’ll learn as we go. You may see pricing changes order to order; changes in expected quantities will predominantly be responsible for this, together with any year-on-year price changes from Cuore itself. Before we open the Team Shop, we agree with Cuore which items we’ll offer. For example, we will sell winter kit when winter is approaching, and we won’t offier it in orders that will deliver in Spring and Summer. In addition, we agree upon how many of each item we think our members will in the order, and this dictates the pricing you’ll see. What on earth is a 2-in-1 road suit? Cuore has developed a garment that isn’t quite an all-in-one skinsuit, but also not just two separate jersey/bib-shorts garment. It’s kind of a hybrid. In a typical skinsuit, there is a single garment with a zip normally running down the front – from top to waist-height. The 2-in-1 looks similar, but the top half of the garment behaves more like a jersey – opening approx 6-8cm either side of the zip, a little bit like a jersey. Like skinsuits, there are no internal ‘bibs’, and that slight constriction feeling of wearing bib-shorts under your jersey is gone. Long-story-short – try it on! The majority of your club mates who’ve tried one on are smitten! We are offering a short-sleeved and a long-sleeved option. What happens after the order closes? Cuore & SUVelo Uniforms review the order, Cuore completes its internal ordering process, and then the custom garments commence the production process. The end-to-end production and delivery process typically takes 5-6 weeks. Where does my kit get delivered to? There is a coupon code for free delivery to Cuore’s store/office (check your email! ); you just simply get along to collect from there once it arrives. The ‘free’ delivery option will have your individually wrapped package of goodies arrive at Cuore’s store/office by approx 18th July for this first order. There are alternative paid shipping options available at checkout, for delivery directly to your home or office. This might be more convenient for you – particularly if you think you’ll struggle to get to Alexandria during office hours. The cost to deliver to your chosen address will vary based on quantity/volume of your individual order. You’ll see that when your complete online checkout. What if I shred my club kit in a crash? Cuore offer a crash-replacement discount, should anyone be unfortunate enough to write off their Cuore club kit. Cuore offer a 50% discount to replace any kit damaged in a crash (doesn’t have to be in a race), provided a minimum of photographic evidence can be provided. So should this ever happen to you whilst riding around in your beautiful SUVelo Cuore club kit, be mindful of this, and get in touch directly with Cuore who will take care of placing a new crash-replacement order for you there and then. That’s right, you don’t have to wait for the club to open a new Team Shop order window, you’ll get a replacement order as quick as Cuore can manage it for you. What if I’ve got other questions?